Colic is an unexplained medical condition which causes apparently healthy babies to cry excessively. The exact cause is unknown - but babies with colic show inconsolable signs of distress which can be upsetting and frustrating for parents. Colic affects one in five babies, and usually involves several intense bouts of crying a day, typically babies will cry for around three hours a day, three times a week or more. For most babies, symptoms of colic will pass within 4-6 months. Babies with colic are usually otherwise healthy. The exact cause of colic is unknown and the condition is difficult to explain. All babies cry - often to communicate when they need something (such as a nappy change, a feed, or a nap). Babies usually stop crying when they get what they want. With colic, however, babies go through intense periods of inexplicable crying which can be very difficult to stop. Babies with colic scream and wail loudly. Their bodies often go 'tense': they may clench their fists or draw up their legs. This can make it very hard to comfort them. Even with attention and hugs, babies with colic may not stop crying for several hours. The cause of colic is unknown: some scientists believe it may be caused by indigestion or wind (sometimes related to excessive air inhalation during bottle feeds), whilst others argue it is due to a newborn's sensitive gut learning to cope with food or caused by an abnormal balance of bacteria, or intolerance to lactose. Other theories suggest colic occurs in 'sensitive' babies who can't control crying, whilst a link has been shown between mothers who smoke, and the likelihood of their baby developing colic. Parents of babies with colic should not blame themselves - the severe crying episodes are usually unpreventable, and the cause remains unknown. As such, there is also no cure for colic either. 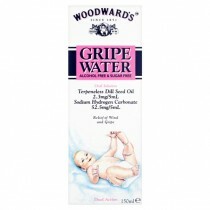 However, various over-the-counter products are available to help your baby, and you, cope with colic. If baby's colic symptoms seem to flare up most after a bottle feed, you could try changing baby's bottle. Various anti-colic baby bottle systems are available, which are designed to limit excessive air inhalation whilst feeding. This is thought to help relieve colic symptoms by ensuring excessive air will not get trapped in baby's stomach during feeds. 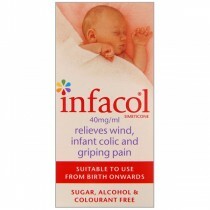 As well as wide-necked baby bottles and airflow control teats, some medical products are available to treat colic. Simethicone drops can be added to bottle milk or breast milk before a feed. The drops help release air bubbles trapped in baby's digestive system. 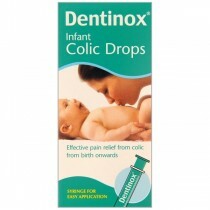 Colic relief drops and suspensions are also available. These help by breaking down lactose sugars in milk - which babies may find hard to digest - so feeding is more comfortable. Alternative treatment options for colic include Star anise tea, massage therapy, Colocynthis herbal supplements and Chamomilla herbal tablets. Scientists in America claim to have discovered a link between babies who suffer colic and mothers who have migraines.